If I could look upon a single scene everyday for the rest of my life I would choose this place, Wast Water, high in the fells of the Lake District. Wast water is a remote area of stunning beauty, I use the word stunning as that is the feeling you have upon first casting your eyes on this place. I remember so well driving through the lanes as they became smaller and more uneven, cattle grids interrupting the drive and the sensation that your wing mirrors were so close to the dry stone walls, that the slightest deviation from the centre of the road would lead to certain removal of said mirrrors! But, that moment when I drove over another cattle grid and passed the National Trust sign for Wast Water I took such a gasp of breath and promptly stopped the car, walked several paces and simply stood in awe at the view before me . The sheer height of the scree covered slopes rising almost vertically from the deepest darkest waters to touch the crystal skies, the contrast to the flat grassy outcrops manicured by the weather, the far shores framed by the rising majesty of Kirk fell, Red Pike, Great Gable and of course the most celebrated of Lakeland peaks Scafell Pike, Englands highest mountain. No written word could convey that feeling on that day in that place. Beauty yet a sense of foreboding combined in a single landscape, pleasure and pain await the cocky conqueror of its peaks, a place where first you loose your breath and then your heart. 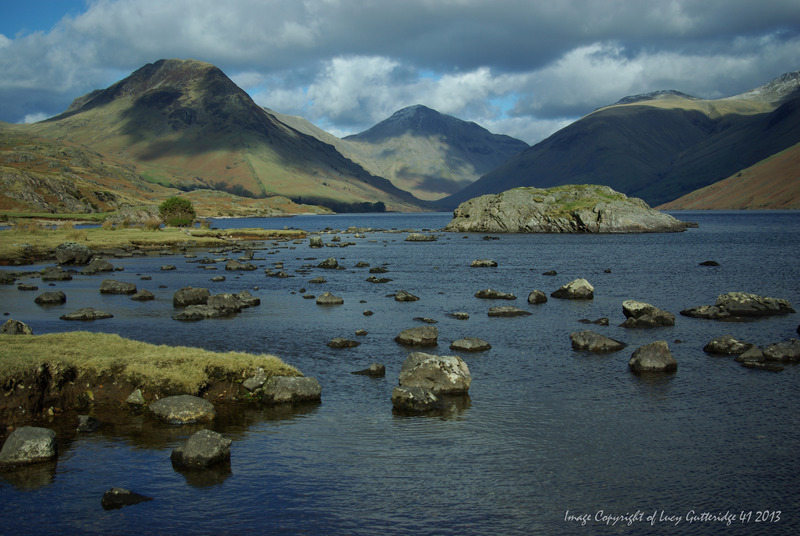 This entry was posted in Landscape and tagged 41, Cumbria, Fells, Hinckley Blogger, Landscape, Pentax K10D, Photoblog, photography, skies, The Lake District, walking, Wasdale, Wast Water, water. Bookmark the permalink. It is indeed a beautiful location, Lucy. Love the light in your photo and the shadows formed on the fells. Hi Simon, thank you very much for stopping to leave such a great comment. Its easy to photographt the places you love, you are spoilt for choice there, and the light changes by the second! Thank u for a great comment! But I do believe that it is the place that deserves the praise, millions of years to create, a second to capture! There are places that even though you leave and return home they stay in your heart, the Lakes are just such a place to me…..
Unauthorised use and/or duplication of material and images contained herein without the express written permission of the Author is strictly prohibited. Images and Excerpts may only be used or reproduced provided that full and clear authorisation has been awarded by Lucy Gutteridge & '41'and clear credit is given to the Author.